The primary and most distinctive feature of the Matuka streamer is its wing—two or more long, soft feathers stripped to their quills on the underside, bound along the top of a fly-body with tinsel or wire ribs. 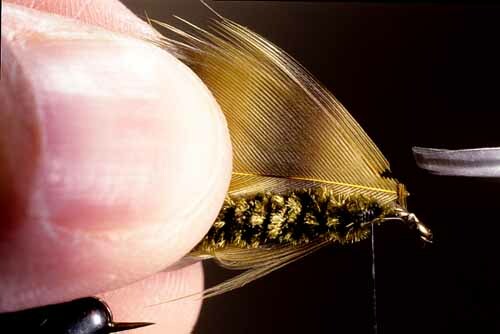 The wing is called, predictably, a Matuka wing, and it's found its way onto a variety of fly patterns over the years. 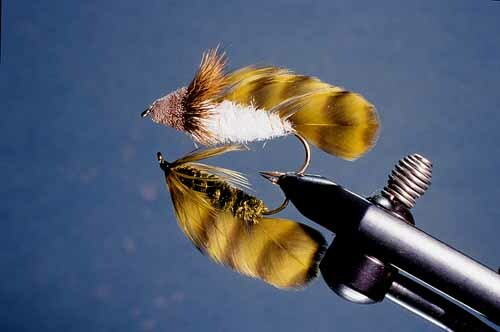 A fly-style from New Zealand, the Matuka was first revealed to North American fly fishers through Fly Fishing Strategy by Swisher and Richards, published in 1975. That, at least, is what my research indicates. Matukas were a hit, and soon began showing up in catalogs and fly boxes. the Matuka wing seldom fouls with the hook's bend, which the conventional streamer wing does fairly often. 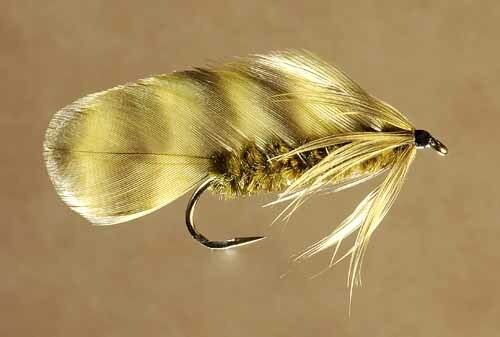 Like the conventional streamer wing, the Matuka wing really fills out the profile of the fly, giving it the fullness needed to imitate a small fish. Some might argue that the Matuka's bound wing is not so free to flex as the conventional streamer wing. Perhaps...but the Matuka sure catches a lot of fish. Two feathers for the Matuka wing, or four, or even six? Each number is effective, each has its supporters. Two to six—I don't think you can go wrong with any of them. used to make a Matuka wing. 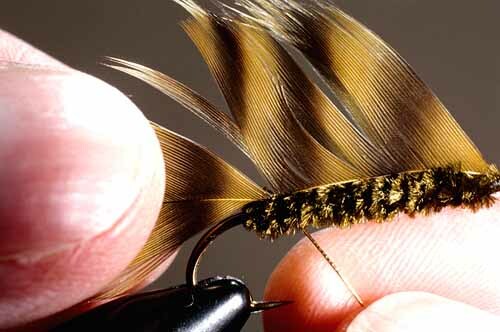 Wide, webby hackles make the best Matuka wings. 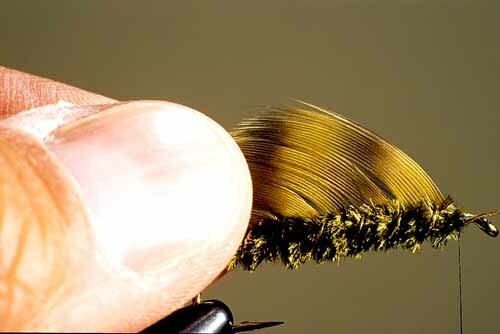 The widest and webbiest hackles I know of are hen-neck and Whiting's Chickabou (my favorite) hackles. 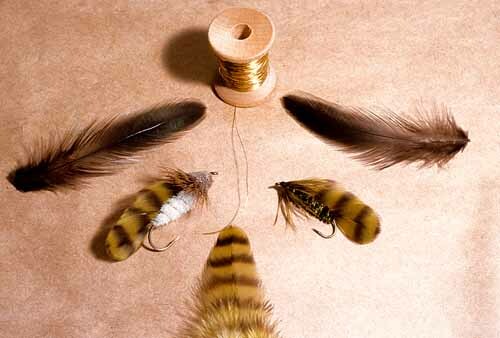 But tiers use everything from Rooster bass-hackles to the biggest softest hackles from a dry-fly neck for Matuka-style wings—all make a perfectly effective fly. The standard rib for a Matuka is oval tinsel, gold or silver depending on the particular pattern. ...well, I guess I just have a prejudice for copper wire. 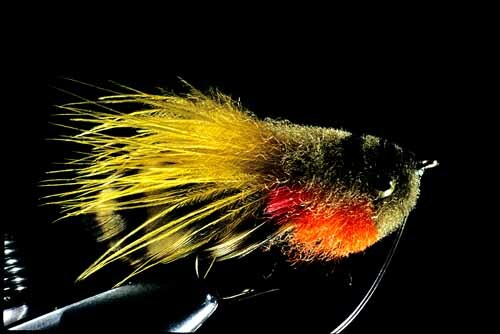 A lot of popular streamer patterns, such as the Muddler Minnow and various imitations of shad and smelt—just about any streamer with a hackle-wing can, and probably has, become a Matuka. 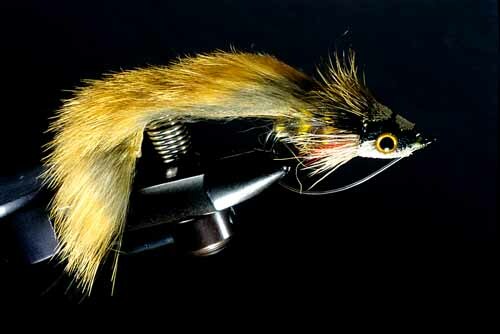 And take a look at bass flies if you want to see some really interesting variations—Jimmy Nix's Shineabou Sunfish has a double Matuka wing— one atop the fly and one below—and Dave Whitlock's Hare Waterpup has a strip of fur on the hide (a "Zonker" strip bound in Matuka-style atop a fur body). The Shineabou Sunfish, created by Jimmy Nix, has a double Matuka wing—one below, one on top of the body. It's trickier to make than the standard Matuka wing, but not all that much trickier. Dave Whitlock's Hare Waterpup has a fur-covered strip of rabbit-hide secured to the body with a rib of copper wire—sound anything like a Matuka wing? 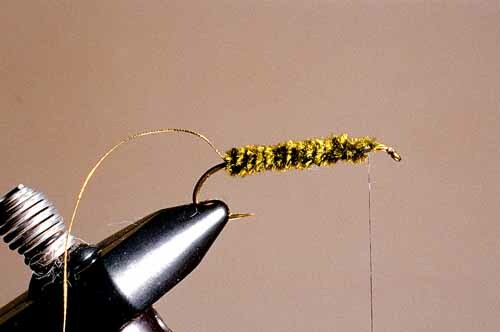 The obvious tactic for improving almost any tying technique is simply to slow down, but it's particularly relevant with the Matuka wing. Tying Matuka-style wings is not fast. Don't even try to hurry. Everything will go wrong if you do. That certainly fits with my experience. One part of the process that will improve in particular with a little added care, and the attendant added time, is the trimming and stripping of the wing-hackles. finally, make sure, as the following captions instruct, to bind the rib along the top of the hook's shank and begin binding the wing only after the rib has come around at the end of its first turn. 1. Bind the oval tinsel or copper wire along the top of the hook's shank, projecting off the hook's bend. Build the body (dubbing, chenille, whatever). 2. 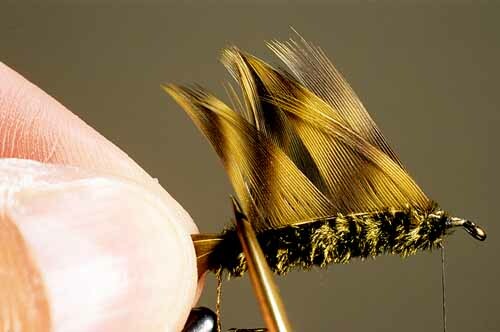 Select two matching hackles, and then cup them together, tips evened. (With more than two hackles, divide them into cupped sets—two and two, or three and three.) Hold the hackles alongside the body. The tips of the hackles should project beyond the rear of the body a distance of at least half the hook shank's length to a full hook's length. Trim off the butts of the hackles just behind the hook's eye. 3. 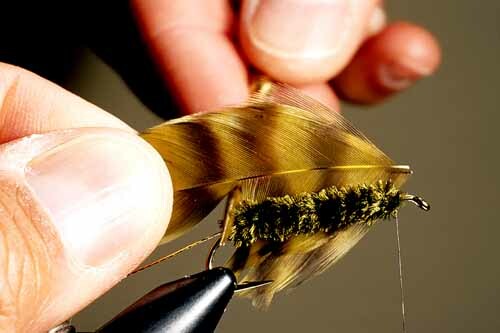 Trim back the tops of the hackles closely, just 1/16-inch or so. 4. Push your bodkin into the fibers on the underside of the hackles at the rear of the body and part the fibers. Strip off all the fibers forward of the parting. 5. 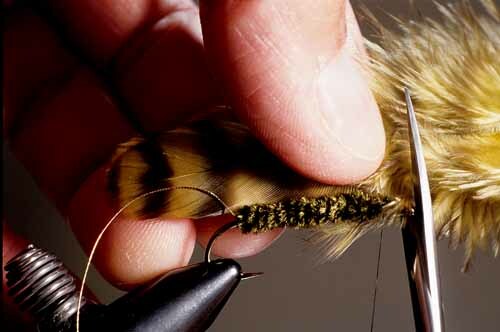 Bind the hackles by their trimmed butts at the front of the body. Hold the hackles down atop the body, grasping them by their tips. 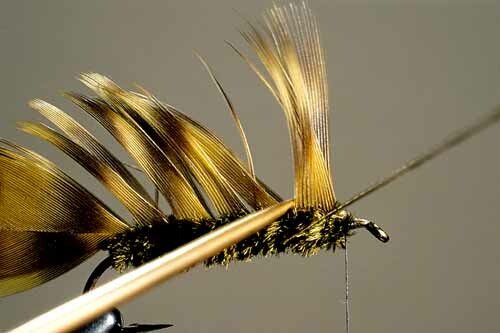 Push the point of your bodkin into the hackle fibers and part them a little forward of the rear of the body. 6. Wind the rib (which should be coming from the top of the hook) once around the body, forward in a spiral, and then through the parted fibers. Now the wing is secured—you can let go of the hackles' tips (so long as you keep tension on the rib). 7. Continue parting the fibers with the bodkin and winding the rib through the parts until the rib reaches the front of the body. Bind the end of the rib and then trim it closely. 8. Stroke the fibers a few times until the parts close and the fibers are joined again as a flat section. To finish out the standard Matuka, all that remains is to make a soft hackle-collar between the body and the eye. and the other the Olive Matuka(bottom).